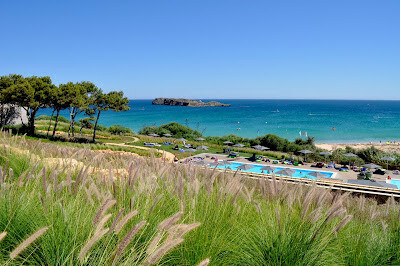 It was our third and final day at Martinhal Beach Resort and Hotel in the south west Algarve. One of my biggest disappointments was not getting much time in the room. Spacious, comfortable, no fuss. It begged for a couple of hours of five star relaxation with the private terrace basking in the sun on the other side of the glass, and a fancy mini-bar looking terribly cramped with so many bottles and goodies aching to be set free. There was also the small matter of the marketing pack we had been given. 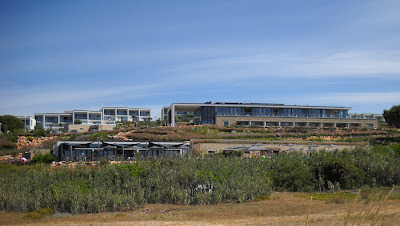 A quick glance told me that you won’t be paying five star prices for Martinhal’s five star comfort and facilities, and I wanted to go through the pack in more detail. Our itinerary listed this as a ‘free morning’, but Joke (pronounced ‘yokay’), our minder and host for the three days, had tempted us with a final morning kayaking excursion. There were the expected ums and ers and polite refusals – some of us were still carrying the scars of the previous day’s bike ride – so it was left to Dermot to man-up. In return for a chance to relax, however, we were all expected to turn up on the beach for Dermot’s epic voyage at 10am. The ‘free morning’ had evaporated before our eyes. 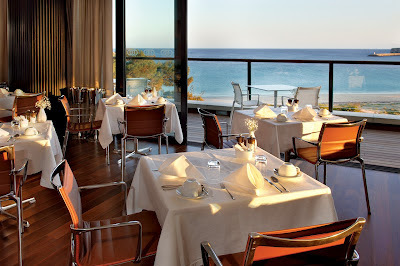 A buffet-style breakfast is served at O Terraco (the formal restaurant in the evenings). There is such a wide choice that the food needs two rooms. At one end there’s fresh orange juice (probably from the orange grove down the road) and champagne (seriously! )… at the other it’s a selection of cold meats and cheeses. If you want something hot, that’s all there too. It really is one of those ‘where do I start’? occasions, and you can order anything that isn’t out on display. As with the other two restaurants, there’s a special area for children, where a member of staff plays with the young ones while parents get to relax over breakfast. 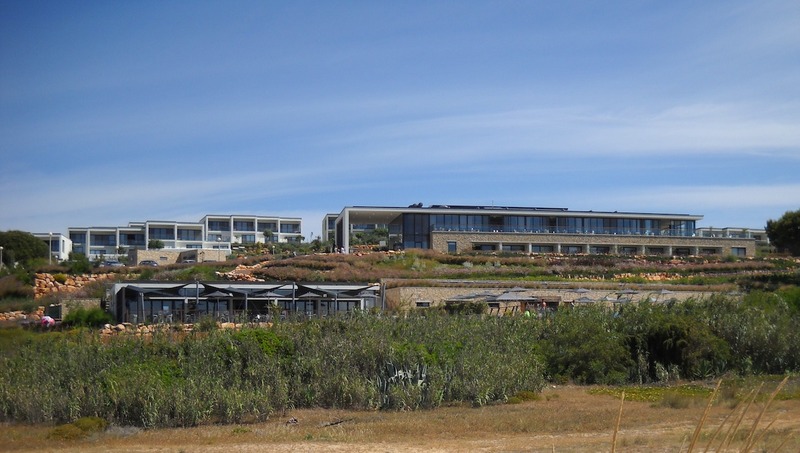 It was easy to see the difference it was making to parents and children alike, and it emphasised that children and family are at the heart of the Martinhal ethos. It’s the sort of place that once you’ve experienced it, you’ll be wanting to come back… if only because the kids will be nagging you all year long. After the night before I wasn’t that surprised to find myself enjoying breakfast alone on the terrace. The pool below drew some early morning volunteers – doing their laps in perfect morning sunshine – and a jogger moved leisurely along the beach, inches from the lapping surf. Joke arrived. She’s Belgian and very good at her job. I’m not just saying that either – she spent the whole three days with us (apart from the bike ride) and joined in our activities whenever she could (she made fools of us on the Padel tennis court and even came to Penina to accompany Charlie in the buggy). We had a leisurely chat about her regular if somewhat unusual commute from Belgium to The Algarve, the story surrounding Martinhal including the small stand of mature pine trees visible from the terrace, and the resort’s sister property at Liss Ard in County Cork. Dermot joined us, grabbed a bite and then the three of us set off for the Watersports centre on the beach, across sand that melted between our toes. Of the other members of our party, there was no sign. We watched Dermot don his lifejacket, drag his kayak to the water and then paddle steadily out into the bay, determined to do a tour of the island. … which explains why Dermot was gone a lot longer than I, or he, had anticipated. He paddled past the island and vanished from view. With so little wind, the sun bright and the water calm, the beach was proving a magnet for families from the resort, but the beach wasn’t crowded. There were only a handful of people in the water, and we finally spotted Dermot reappearing about fifteen minutes after his disappearance. Kayaking, wind-surfing, surfing, parasailing… you can do it all from the Watersports Centre right on Martinhal’s private beach. They even have dinghies and mini-catamarans, but I think Dermot had had enough by the time he returned. It’s over half a mile to the island, which is hard going on the shoulders – and there was still a round of golf to go. What’s more, Dermot was on my golf team so I didn’t need him wearing himself out. We’d pulled straws to create two teams of three with the combined scores from the two days determining the winners. 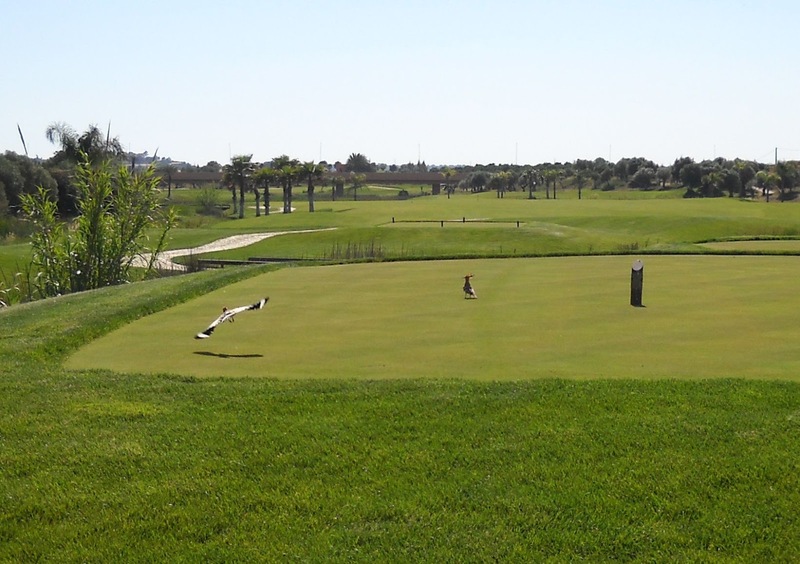 After one round at Penina, we were in front – just. 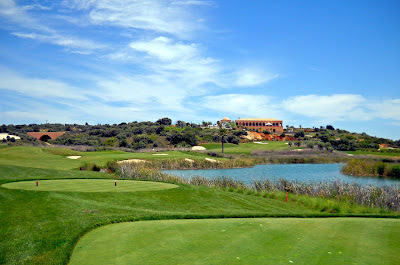 There was time for one last delicious lunch on the terrace of As Dunas, and then we were off to Amendoeira Golf Resort, where Christy O’Connor Jnr and Nick Faldo have each designed a course under the Oceanico brand. It’s modern, it’s new and it’s big and brash. It is about as far from Penina as it’s possible to go in terms of design and subtlety: to call the clubhouse huge would be an understatement. And it all looked highly impressive on the drive over the specially built bridge that passes above the O’Connor course. Generally speaking, the O’Connor course is on the low ground, while Faldo’s slips up and down a nearby hillside. The O’Connor is longer too with constant water hazards, but by all accounts it is the less strenuous test. We played off the forward tees (we weren’t blessed with time in terms of our flights) and the course was remarkably benign from such a position (5,900 metres). Big fairways and greens and, despite water, it is spacious for much of the round. Buggies are almost a must. Temperatures aside, there are some walks from green to tee – and late on a buggy may prove a blessing. As we split up into our two threeballs, someone came out and poured ice into the buggy’s drinks box. I’d bought two 2 litre bottles of water for the heat and it was almost too cold to drink after 15 minutes. There’s a winding drive down to the first tee, past a statue of Christy himself (there’s one of Faldo too), and then a par five to start proceedings. 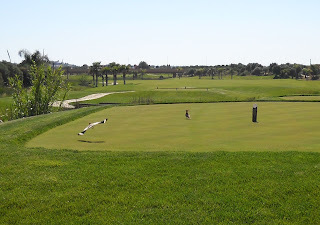 An opening salvo of pars is always going to leave you liking a course, but at the end I preferred Penina. The O’Connor has some superb holes (3, 10, 14, 15 and 18 come to mind) and it is clearly a driver’s course, but Penina demands more restraint and imagination. On the 15th tee we encountered some woodpeckers who had been knocking around the place all day. It was a nice addition to a very quiet round of golf – the place was deserted, and the extensive development of houses overlooking the course are all empty… and in NAMA! In the end, the combination of Karl, Dermot and myself came out victorious, but there was no time to celebrate as we were bundled back into the minibus for the 30 minute trip to the airport. We made it comfortably, returning our golf clubs to the clubstohire stand before standing stationary in a queue for half an hour. Dermot was telling me that over 70% of traffic through Faro Airport comes from Ireland and the UK. 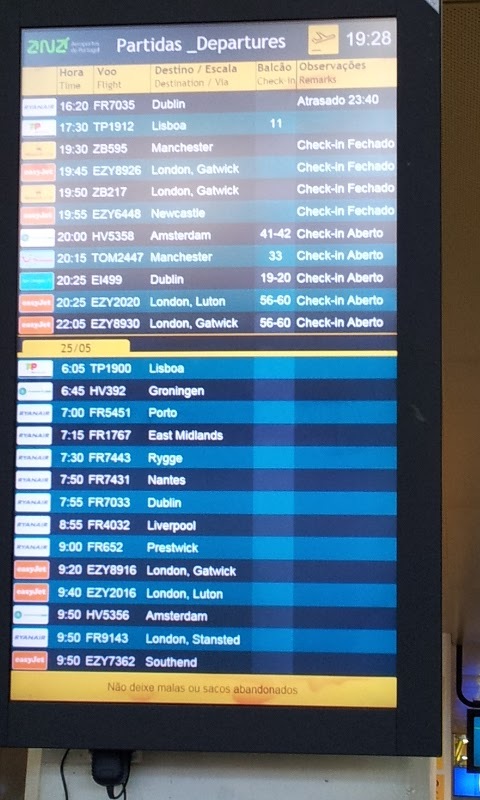 Looking at the Departures screen, it seemed eminently possible. 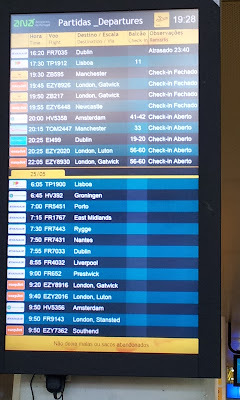 There was one final twist as we sat on board the Aer Lingus plane at 8.30pm, waiting on someone who’d decided to go walkabout. The Portuguese air traffic controllers were going on strike at 9pm. If we didn’t take off by 8.40pm we wouldn’t be taking off at all as we wouldn’t clear Portuguese air space. The errant passenger finally arrived, a gentleman who looked to be in his 90s and on crutches. As he took his seat – sloooowwwwly – the air hostesses were running up and down the aisle checking that the doors were shut. Yea, I thought as the plane headed for the runway, that helps. This was the first media trip I had been on and it is an experience I won’t forget. 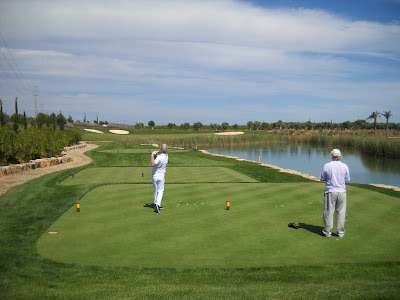 It was organised with great precision by Destination Golf, hosted wonderfully by Martinhal, and included two great rounds of golf. Nothing was too much trouble, and the Taylormade clubs I was given by clubstohire were excellent – true, I hated the big white-headed R11 driver, but the five wood was a thing of beauty. If you're looking for somewhere to stay with a gang of golf buddies, then Martinhal isn't it. No, Martinhal is a romantic getaway or a family-friendly vacation... with the opportunity for a golf nut (or nuts) to slip away for a round of golf or two on the quiet. The folks at the resort were unbelievably generous with their time and hospitality and names must be named – so, thank you to Roman and Chitra (the owners), Joke, Nick, Rob, Rosa, Vasco, Manuel and David. 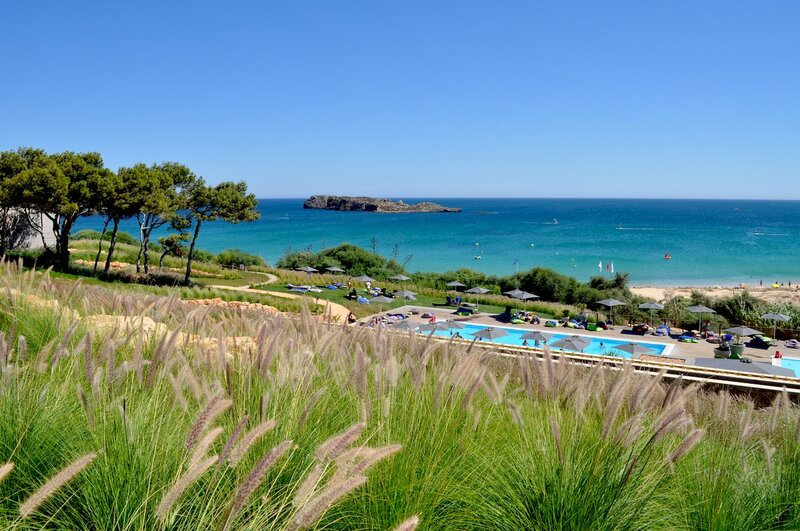 They epitomise the friendliness and relaxed nature of Martinhal. Prices at Martinhal Hotel start from €141 per person, per night for dinner, bed and breakfast, based on two people sharing. Weekly (7 nights) B and B rates start from €1,568 for a family of four, and include either lunch or dinner. Houses and villas are also available to rent with an 8 day/7 night package for a two-bedroom self catering house (2 adults and 3 kids) for €1,890 (includes one meal per day). Aer Lingus flies daily to Faro from Dublin, Cork and Belfast. For more information on fares and schedules log on to www.aerlingus.com. All the major car hire companies are at Faro.